On a bed of peppery arugula, this burrata with tomato peach jam makes a perfect starter or light meal. This is my take on one of the most delicious restaurant appetizers of the moment, burrata with tomato jam. It hits all the right taste notes: peppery arugula; tangy-sweet tomato peach jam; and creamy, rich burrata, the fresh Italian cheese made from mozzarella and cream. The only cooking involves the jam but it’s quick to make and, as a bonus, you’ll be left with extra to use on burgers, grilled meats or fish, or sandwiches throughout the week. While this dish makes a great starter, I often add more arugula to transform it into a main course salad for lunch or a light dinner. Because burrata as a meal…yes, please! 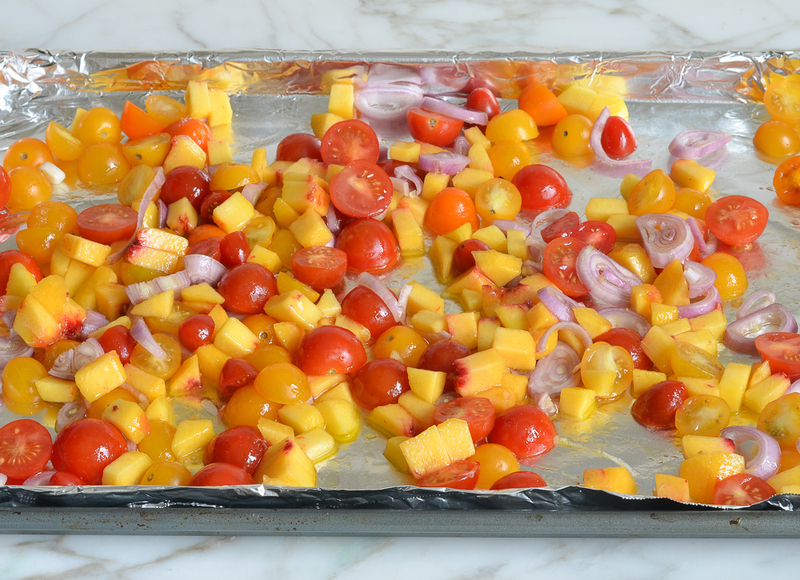 To make the jam, place the tomatoes, peaches, and shallots on the prepared baking sheet. Add the salt and the olive oil and mix with a rubber spatula until evenly coated. Transfer the roasted fruit and shallots to a small bowl (be sure to scrape up all the flavorful juices from the baking sheet). Add the sugar and mash with a rubber spatula or spoon until jammy. Taste and adjust seasoning with more salt or sugar, if necessary. Chill in the refrigerator until ready to serve. To assemble the dish, place the arugula on a plate or serving platter. Spoon the tomato peach jam over top, then place the burrata on top of the jam. Drizzle the cheese with olive oil and sprinkle with salt and pepper, to taste. Serve with bread or toast, if desired. Enjoy! Divide the arugula onto 2 plates or arrange in 2 piles on 1 large serving platter. Spoon about 3 tablespoons of the tomato peach jam over each pile of arugula. Place the balls of burrata partially on top of the jam. Drizzle the cheese with olive oil and sprinkle with salt and pepper, to taste. Serve with bread or toast, if desired. Burratta is my husband’s favorite and we usually do with pesto and tomato and were excited to see the peach ‘twist’ here. delicious! Absolutely delicious! A huge hit at a recent dinner party. I will reduce sugar slightly next time. Thanks for another delicious recipe, Jenn! We summer in a remote area of the Adirondacks so substitutions are often necessary. We used mozzarella instead of burrata, and plums for peaches, honey for sugar……it was fabulous. Plenty of jam left over for another day. Love the idea to use plums, Jane – I’ll have to try that! I live in the U.K. and plums are in season will try tomorrow night for my dinner party. If I switch honey for sugar – is it 1 to 1? Yep – please lmk how it turns out with the plums. This was delicious. The only change I made was to cut the sugar to 1 TBS at the end of making the jam. What a perfect summer appetizer! I’m using the jam tomorrow on grilled turkey burgers. Thanks Jen for another winner!!! Looks incredible! Bake at 400? Hi Christine, You can find the jam recipe here. what is a substitute for fresh burrata? Cant find it in our stores. I will be making it next week . Hi Bernice, Sliced fresh mozzarella is a good substitute. Enjoy!